Weekly horoscope 2016 from June 6 to June 12. Read the predictions based on moon sign and follow the respective remedies to make your life better. The general horoscope & love horoscope predictions are based on Vedic astrology. Angels are bringing happiness for you in this week. You will be appreciated by everyone at your office. Loved ones will support your in all things and children will bring goodness in your life. People will enjoy your company and the way you carry yourself. A really good time for those who are in teaching profession, defence, and banking industry. Those who are looking for job will get it. Love Predictions: With many lovable moments to cherish the week has arrived, Arians. This week love partner will come to meet you. With him/her you will going to enjoy many exciting and happening outings. But, Arians this situation will going to fetch more auspicious results in the initial days of the week. Mid week is also good, a peaceful aura without any stress will be maintained. While weekend will bring fresh breeze in love. Remedy: Donate Urad Dal to the needy. You will succeed in defeating everything you will face. Your courage will help you take right decisions for yourself. People who try to demoralise you will fail in doing so. However, there will be times when you might have difficulty in handling some situations but you will manage it nicely. Just avoid bad company and get ready to enjoy profits from business. 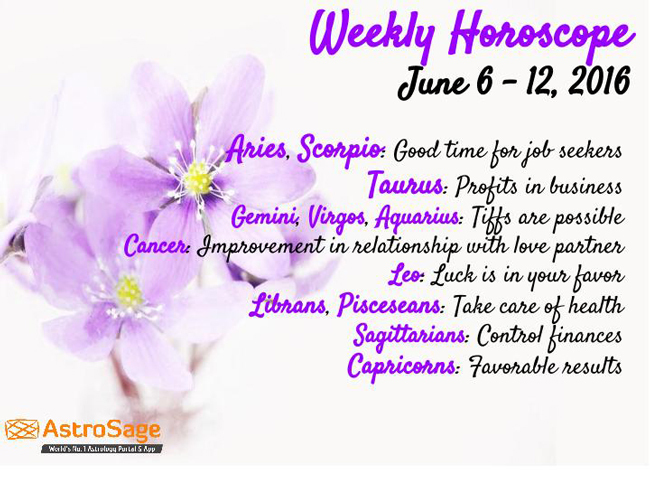 Love Predictions: Taureans, this week you will see yourself doing things in a hurry and under such circumstances, you might be able to make less time for love partner. Although, whatever time you are provided with will be enough for you to celebrate. The beginning of the week will be spend in chit-chatting but, be careful do not let some arguments turn big. Mid week is exciting. Lastly, over the weekend some expressions of devotion to love will not let go of stress . Remedy: For increasing luck, offer Dhruv (grass) to Lord Ganesha every morning. Money is coming to your life but your expenses will also increase. The ones who have headache or blood pressure problem need to take good care of themselves. Pregnant ladies have to be very careful about their health. Be focused about your goal. Any friend might ask for help but make sure they really need it and not fooling you. You can take important decisions about family or work. Love Predictions: Geminis, this week will be a normal week for all lovebirds. As per prediction, if your partner is away, he/she might come to visit you. In the starting days of the week, a state of being emotional might be experienced. During that time your partner will value your emotional feeling. While in the middle of the week some tiffs are possible, but not to worry weekend will be of super fun and full of entertainment activities. Remedy/Treatment: Offer water to Lord Sun every morning. Personal life of the natives will have little highs and lows. Control your anger to make your relationship a peaceful one. You might have to work more toward your work to get what you want. However, there are chances that you will get unexpected money. Just keep control on your words and enjoy the support of family and friends. Love Predictions: Cancerians, time is not always same, life has to face some ups as well as downs. Hence, this week will not prove to be the best one for you. Moreover, in such cases one should prevent doubts from arising into the relationship. Except from all this in initial days of the week efforts are required to meet your lover. Midweek is quite cool, but in weekend make sure that partner is not falsely misunderstood by you. Remedy/Treatment: Perform Rudrabhishekam for controlling anger. This week is going to be amazing as luck is with you. Everything will be happy and cooperative around you. The natives will personally feel the improvement in their financial status. You will get more respect in society and feel more courage in yourself. You will be there to help people but make sure you are not being egoistic. You will feel inclined toward spirituality. Love Predictions: Lions, this week you will going to found yourself lucky in love matters. An amazing series of good results can be expected provided if you believe in maintaining purity in love. The starting days of the week will be auspicious. A great warmth in love will be felt between partners. But, it seems that in midweek you will find less chances to be with your soulmate. Lastly, weekend will solve and fulfill all your tensions. Remedy/Treatment: Help poor or needy, as per your abilities. This week is asking you to be very careful in all stratas of life. Be it about giving loan to someone, or your personal life, you will have to be cautious. There will be times when you will not be able to cope up with your partner. Your parents will try to help you out as much as they can, but in the end things have to be handled by you. Just have patience and beware from enemies. Love Predictions: Virgonians, get ready to experience an amalgamation of results. This week, you are required to be careful as possible chances to fall in conflicts with girlfriend/boyfriend are there. Therefore, try to avoid such conflicts to fetch good results. In the beginning of the week you might find yourself indulging in lots of work, so it’s your duty to balance love and professional life. Mid week is quite amazing while weekend is little weak. Remedy/Treatment: Take care of your valuables like money and jewellery. Everything except your financial life is going to be great. Your courage and intellect will be high which will help you deal with every situation. You will have to wait for the right time to take any decision related to finances. However, those who are looking for job will get favorable results. Take care of your health and maintain hygienic routine. Love Predictions: Librans, get relaxed and be ready to experience a soothing week. Although, for this you need to deal frankly with your partner. In the beginning of the week, you may visit at some sacred place together. In midweek; love, affection and honor will be welcomed in your relationship. Moreover, your weekend will also seems to be filled with excitement. Those who are singles may get love proposals. Remedy: You can perform Yoga for maintaining good health. You will go to some place as your office trip is most likely to happen. You will enjoy your life with family and friends. Working life will go with relaxed pace and you will get benefits from it. Domestic life of the natives will be peaceful and happiness will prevail everywhere. Favorable time for those who are looking for a job change or preparing for competitive exams. Love Predictions: Scorpions, good results out of love are expected. This week you will be successful in managing work and love at the same time. You will get more auspicious results if you fall in love with a colleague. The initial days of the week are less auspicious. Therefore, as per your horoscope your are advised to control your passionate desires. Midweek is wonderful and weekend will provide you with promising results. You will have amazing confidence in all the decisions you will make. So, doing anything related to your finances or anything domestic will give you desirable results. Try to control your expenses and avoid unnecessary shopping. It is a good time to do things that require intelligence. You will impress people with your beautiful sense of humor. Love Predictions: Sagittarians, this week will bring mixture of results. Maintaining transparency in love will bring more favorable condition to your love life. Beginning of the week is awesome, especially for married couples as they will granted with many good outcomes. But, in the midweek be careful and behave in a moralistic manner. Lastly, in the weekend betterment in the atmosphere of love will going to be felt if possible visit some sacred place together. Remedy/Treatment: Avoid wastage of money. The personal life of the natives that is the relationship with your family and friends will be great. Happiness will prevail everywhere and your children will bring good news for you. Fame and respect in society will be enhanced in this week. Avoid being rude at home or anywhere outside. Take care of your family and yourself. Love Predictions: Capricorns, a passionate love life will going to be experienced by you. If you are thinking of making marriage proposal then you may get positive results. Initial days of the week are beautiful, moreover if you intentionally give arise to a conflict, you will going to have more fun. Mid week is quite beautiful but over weekend some weak moments might be experienced. There will be times when you might feel restless and irritated due to some hurdles in your office work. Even though your partner might try to share your tension, you will have to help yourself first. Just be cool as your work will be completed on time. You will get support from your family and plan a trip in the weekend. Love Predictions: Aquarians, week is auspicious to fulfil sexual desires at the moment. However, some tiffs may arise but this will not affect your cute love story. In the initial days of the week, love will reach at its top position. This week you may fall in love with a colleague or a classmate. Mid week and weekend both are wonderful but it will be more of fun for married couples. Remedy/Treatment: Offer gifts to your juniors. Positivity is prevailing throughout the week. You will take major decisions in your life and face everything will full confidence. There will be some ups and downs in your personal life but you have a smoothness maintained. Ask your partner to take care or even you can share your caring attitude with them. Appreciation is what you will get from your office. Love Predictions: Pisceans, the week is auspicious to make passionate fantasy turn real. Although, the starting of the week is little less favorable as some mental stress might bother you. But, not to worry mid week will going to be the happening one, especially for one whose love partner works in a same organisation or is a classmate. Lastly, the weekend is fantastic with the possibility of little tiffs. Remedy: Either plant a new fruit tree or serve a fruit tree. Download & Update New “AstroSage Kundli 7” Now!